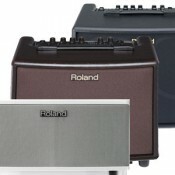 Looking for a speaker cabinet to brighten up your bottom-heavy bass rig? Or, maybe you’.. 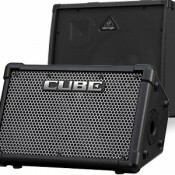 This is the speaker cabinet for the bass player who demands the ultimate in a single, compac..
Portaflex PF115HE flip-top bass speaker cabinet Drawing from the classic design of Ampeg&rsqu.. The Portaflex PF350 bass amp head Ampeg’s Portaflex PF-350 delivers legendary Ampeg ton.. The Portaflex PF500 bass amp head Ampeg’s Portaflex PF-500 delivers legendary Ampeg ton..
Donald "Duck" Dunn (Crosby Stills Nash & Young, Stax recording legend) &quo.. The sound is in your head. You've played countless instruments in search of the ultimate.. This is the fridge. This is the speaker cab that owns the stage. 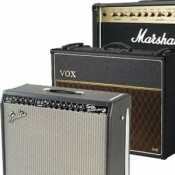 This is the speaker cab you.. 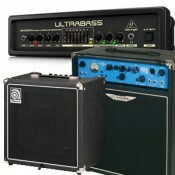 The Ultratone KT108 15-watt keyboard amplifier The awesome and super-compact KT108 .. The Blackstar HT-5 Tube amp is a great little gig amp that lets you turn it right up and get the fla..
'65 Deluxe Reverb - classic Blackface tone The 22-watt ’65 Deluxe Reverb® amp i..
Bassbreaker 15 combo Supercharged with a plethora of flexible features, the Bassbre..
Bassbreaker 18/30 combo Bassbreaker series guitar amplifiers continue Fender’s storied ..
MORE ABOUT BLUES JUNIOR™ III The world’s most popular tube amps just got better! Fend..
George Benson Hot Rod Deluxe 112 extension cabinet The GB Hot Rod Deluxe 112 Enclosure pairs .. Hot Rod Deluxe III 40-watt all valve combo The world’s most popular tube amps just got ..